This week, OpenGov had the chance to talk to the team behind the Singapore-MIT Alliance for Research and Technology (SMART) Autonomous Vehicle Trials in One-North. We were lucky enough to sit in the passenger seat of SCOT, Shared Computer-Operated Transit vehicle. The development of SCOT comes out of the SMART Interdisciplinary Research Group for Future Urban Mobility. The objective of this research project is to allow a fleet of Autonomous Vehicles (AVs) to provide Mobility-on-Demand (MoD) which will complement the existing transportation system, so as to reduce the overall commuting time by solving the “first-and-last-mile” problem. 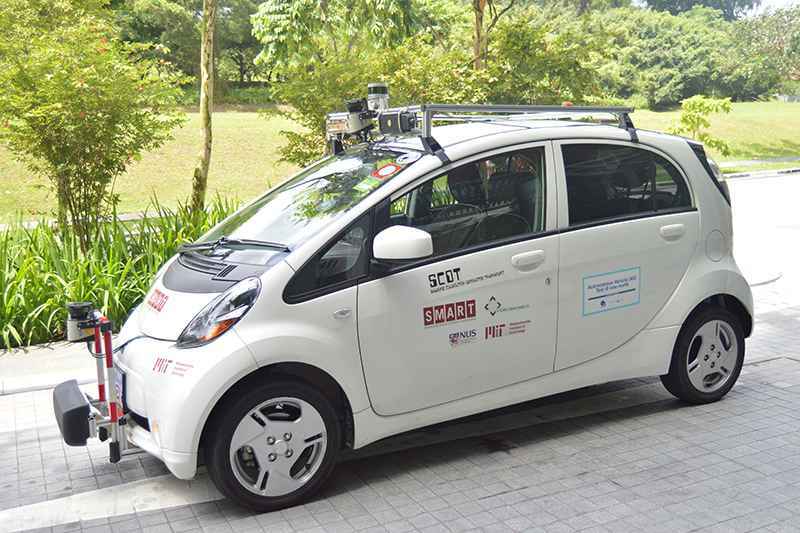 The self-driving car has been operational since January 2014, while similar challenges have been tested on self-driving golf buggies on NUS campus since 2011. Since last year, the group has been permitted by LTA to run trials of SCOT throughout One-North. However, in this trial period, it has been mandated there must be a person behind the wheel of the car. How does an autonomous vehicle work exactly? After overcoming the shock of being able to ride such a vehicle, we had one of the team’s researchers explain all the functions and quirks of the SCOT. The steering, braking, and throttle was controlled by SCOT- all on its own. Manual control can override the autonomous control, with a flick of a switch. On board the SCOT, you will see the steering wheel is fixed with steering motors with a gear and sprocket to control the steering. There are motors which spin levers attached to pedals which will control the throttle and brake. In the front of the vehicle, there are laser range sensors for obstacle detection, sensors for mapping and localisation, and other sensors that they are using for benchmarking. The computer rests in the trunk of the vehicle which holds the mapping, circuit breakers to protect sensors, and the power distribution system.